Ok, so I already blogged about Giordano’s Pizzeria on the post below this one. 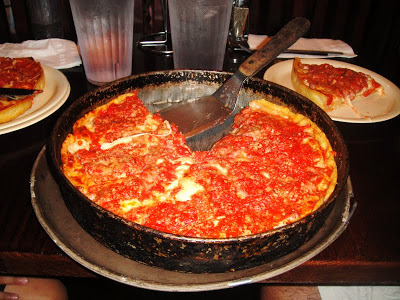 I gave you the rundown on the most famous deep-dish pizzeria’s in Chicago, and now I am blogging about the infamous Lou Malnati’s. Many say this is the best pizzeria in all of Chicago and the pizza is indeed good. Again, same as Giordano’s, it takes an average of 45 minutes for your pizza to be made. It felt like we were waiting forever, but that’s how you know they make it fresh and custom made just the way you order it! Giordano’s pizzeria is famous for their STUFFED deep dishes, and Lou Malnati’s is known for their famous “Buttercrust” pizzas. The crust is buttery, flakey and has a hint of garlic. Their famous Buttercrust is what sets Lou Malnati’s apart from the other Chicago pizzerias. This place is a Chicago landmark and has a lot of history. Check out what we ordered below! Oven roasted, then fried Buffalo style wings tossed in “mild with a little giddy up” sauce. Served with celery and gorgonzola or ranch dressing. They were okay. They weren’t crispy enough, more soggy. I’ve had better. Fresh spinach, mushrooms and sliced tomatoes covered with a blend of mozzarella, romano and cheddar cheese. No substitutions. This pizza was great! Very flavorful and lots going on. The buttercrust was so good too! I really liked this pizza- one of Lou Malnati’s most famous! I ordered this pizza- I custom made it, although it’s pretty simple lol. It was definitely good but not mind-blowing. This was my FIRST deep dish Chicago-style pizza experience, and I guess I had extremely high expectations. I wish we would have ordered one big pizza instead of two individual sizes. But I must admit, for being a thin-crust New York style pizza kinda gal, Lou Malnati’s pizza is still very good and I can see why so many people love it. Very fresh and rich, and the buttercrust added great texture and flavor. I would definitely return to Lou Malnati’s! I visited the famous Chicago “BEAN” in Millenium Park! I fell in love with this city. It’s so beautiful. If you’ve never been to Chicago, you must go. It’s breathtakingly beautiful- amazing building skylines, river views, bridges, and historical architecture. Every where you look it’s a postcard and it’s just an overall charming city with super friendly people. You can’t go to Chicago without seeing all the beautiful sites and of course eating at one of Chicago’s famous pizzerias, such as Lou Malnati’s!